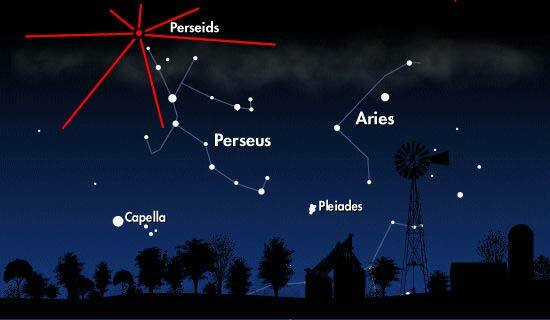 Moon phase is not favorable for gazing at the Orionids meteor shower. The peak of this shower coincides with a Waning Gibbous Moon, so fainter Orionids meteors will be difficult to observe. 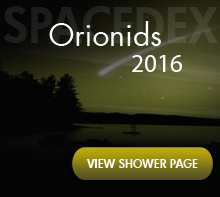 In 2013, the peak of the Orionids meteor shower will coincide with a Waning Gibbous Moon. Due to its close proximity to the October 18th Full Moon, the Moon will produce unfavorable viewing circumstances for observers in both hemispheres. The Orionids occasionally produce fireballs that light up the night sky, so those willing to stay out and watch may be in for a treat. With an upwards of up to 20 meteors per hour predicted, it may well be worth staying out to catch quite a few bursts of light streaking through the night sky. Typically, under entirely clear skies, observers may witness 10 to 20 meteors per hour; but these rates can exceed up to 25 meteors per hour in rural locations. Be aware that local conditions such as light pollution, cloud cover, and precipitation will also play a major role in the number of meteors you are likely to see. Less is usually better when it comes to observing a meteor shower. For the best viewing experience, find an area unobstructed by a structure that is far away from city lights. Using optical devices such as binoculars or telescopes is not recommended, as your field of view will be greatly restricted, thus making the possibility of missing a "shooting star" more likely. Once you have found an observation spot, face half-way up toward the southeastern portion of the sky. Face northeast if you live in the southern hemisphere. 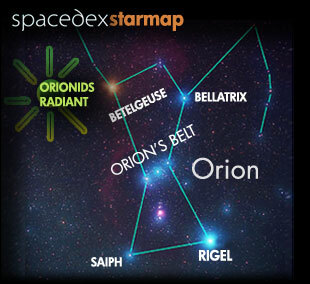 Looking in this direction, you will have the constellation of Orion, the radiant of the Orionids meteor shower, within your field of view. Not coincidentally, the Orionids meteor shower is named after Orion for the reason that they appear to originate from the Club of the famous �Hunter� constellation. Looking directly up at the sky or into the radiant is not recommended since this is just the point in which they appear to come from. You are more likely to see a trail when looking slightly away from this point. Looking half-way up into the sky will lead to the best show in the house. Observing a meteor shower is sometimes takes a great deal of patience, but if you hang around long enough, you should be rewarded with a an experience that won�t soon be forgotten. Blissful gazing! Orionids are among the fastest-moving meteors. These meteors typically strike our atmosphere while traveling at speeds of 66 km/s (about 148,000 mph).